The developer is appealing against Hart’s refusal of the Owens Farm planning application for 700 dwellings. The appeal hearing starts on Tuesday 19th March. Hook Action Against Overdevelopment invited Whitewater Valley Preservation Society to speak at the appeal against this development, because of the strength of our previously submitted objection. We want to show the Planning Inspector the enormous level of dismay and concern at this application. The appeal starts at 10am on Tuesday 19th March in the Council Chamber at the Hart District Council offices, Harlington Way, Fleet GU51 4AE. Parking is available in the Victoria Road car park. The hearing will run until Friday 29th March, although likely to exclude Monday 25th March. We urge you to attend whenever you have a chance. You can come and go as you like during the hearing. A large representation on the first morning will make the greatest impression on the Inspector. The inspector will probably visit Hook on Monday 18th March and make other visits during the appeal. She will not only visit the site but also other parts to fully appreciate the implications on Hook as a whole. Thank you in anticipation of your help in trying to get this appeal refused. We would also like to take this opportunity to say a very big thank you! We have seen objections from over 310 people to the applications to deregister part of Jubilee Green / carry out restricted work on Hook Common. A great result – thank you! Attend parts of the Owens Farm Inquiry – from Tuesday 19th March, 10am. It really will help! Print out the poster using the link in the email and display it in your window or at the front of your property. Continue to watch out for and let us know about any signs of environmental, wildlife and traffic surveys or other indications of any developments around the village. 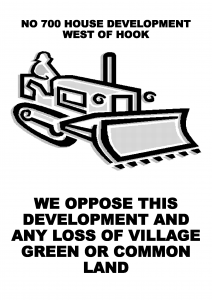 Please continue to spread the word about Hook Action Against Overdevelopment. Encourage family, friends and neighbours to register for these updates at hookdevaction.org.uk/subscribe and follow us on Facebook.